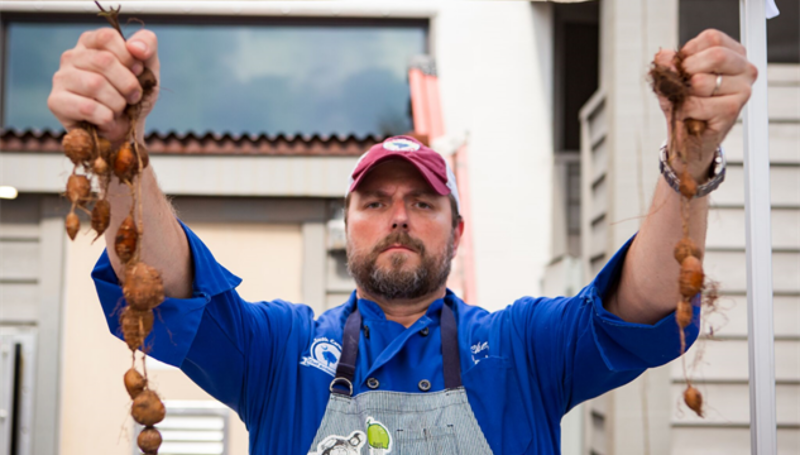 Chef Forrest Parker, the city’s only Palmetto Guild Certified chef guide, leads you on a 3-hour experience unlike any other. You’ll begin with a 90 minute walking tour, exploring the complicated history of the Holy City and the culinary influences that shaped Charleston into one of the world’s top food destinations. You’ll visit the not-to be missed sights, but also the lesser known and understood locations where, for example, an enslaved chef created a recipe that still helps define local menus. The tour concludes at the cozy Bistro A Vin where you’ll relax while Chef Forrest teaches you how to cook three dishes from recipes he wrote interpreting definitive Lowcountry classics, and prepared using techniques he mastered over two decades. He’ll serve you those recipes for lunch while you enjoy a carefully curated wine pairing (or cool, delicious sweet tea if you’d prefer). You’ll go home with Chef Forrest’s recipes as his gift to you. Scroll down to book your tour. What times are the tours offered and how much do they cost? Undiscovered Charleston tour experiences take place from 10 a.m. – 1 p.m. every day but Tuesday. The tours are $125 per person. Guests must be booked paid for in advance. Where do we meet and park? We’ll meet the Pineapple Fountain in Waterfront Park located at the end of the street called Vendue Range. Park in the Prioleau Garage a block away, or along the street. Charleston’s lovely old sidewalks and cobblestones can be uneven so flat, comfortable shoes are recommended. It is often sunny and hot, so hats and sunscreen work wonders. Tour guests will need to show proof of age, due to the wine pairings. Older teenagers accompanying parents are welcome and will be served sweet tea. Our tours are RAIN OR SHINE. Cancellations are accepted until seven days before your tour.